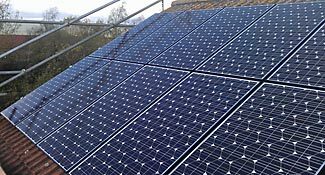 Mr M had his solar panel system installed in October 2011, on his South facing roof in Nottingham. He is now receiving the Government Feed In Tariff (FIT) at a rate of 43.3p/kWh for the generation and 3p/kWh for the export tariff, which is deemed 50% of the electricity generated. Mr M is likely to receive a generation income for the first year of £1,114.98 and £180.25 savings from energy used. Combined with an export value of £38.63 he is likely to see a total income and savings for year 1 of £1,333.86. He will receive guaranteed payments from the government FIT scheme for 25 years, plus these will be adjusted for inflation using the Retail Price Index. He can expect his combined savings and income over the next 25 years to be around £41,236 and he will also be happy knowing that he is reducing his carbon footprint.